Hardwood floors require specialized care to remain beautiful year after year. 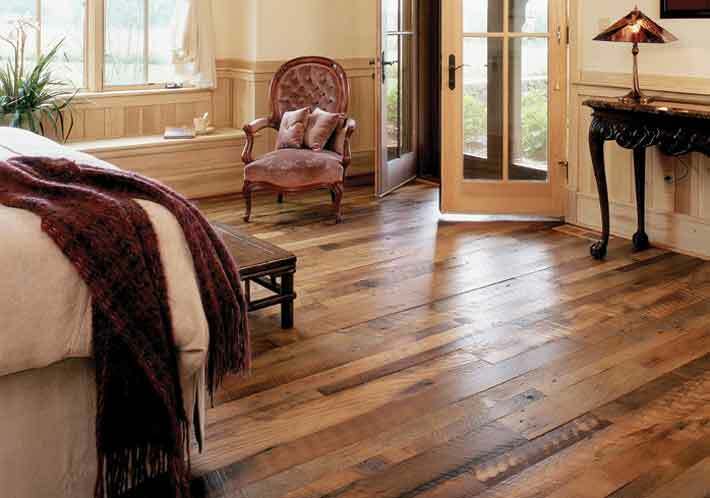 Even so, wood flooring continues to be in high demand. If you are about to choose wood flooring for your new home or renovation, how do you know what to pick? Deciding on what to buy can be confusing. Here is a quick guide to choosing your wood floor. By the way, the perception that wood floors are expensive to buy and install is no longer accurate. The range in choices includes one top rated laminate that can be bought and installed for under $3 a square foot. The four most popular wood floor installations are solid site-finished, solid pre-finished, engineered, and laminate. Here are the advantages and disadvantages of each type of floor. Site-finished solid wood. This floor is first installed and then the stain and finish are applied. Advantages include lower cost, a wide choice of wood species (including bamboo), and several thickness choices. Disadvantages include variability in the installation (difficult installation, moisture content might not controlled), not recommended for basements (moisture variability), and generally a less durable finish. A plus: this floor can be refinished numerous times and exhibits wonderful sound and feel underfoot. Pre-finished solid wood. This floor is finished at the factory, and once it is put down in your home, no other steps are required to finish the surface. Advantages include durability and generally more time before refinishing, and what you see is what you get. Disadvantages include a 35% higher cost per square foot, and it is not a good choice for basements because of the changes in humidity which can cause warping and cupping (similar to site-finished). This floor, like the site finished, has great sound and feel underfoot. And like site-finished, it also requires expert installation to avoid problems later. Engineered wood. This floor choice is made with real wood veneer glued to a substrate. It is difficult to tell this product apart from solid wood. Advantages include easier installation, resistance to problems caused by moisture (it can work well in the basement), and lower cost per square foot. Disadvantages include not being able to refinish the surface multiple times and showing wear faster than solids. Plastic laminate. Laminate wood floor products have come a long way in the last 15 years. The product is made by installing a realistic printed photo of the desired wood over a substrate and then placing a tough plastic finish over the top. Some laminates are hard to tell from the real thing. Advantages include low cost, easy installation (good DIY project), and durability. Disadvantages include not being able to refinish and a less substantial feel underfoot. No matter what type you choose, pick an installer carefully. Subfloors must be prepared correctly to install wood or laminate. The product must be installed according to the manufacturer’s directions. If you are a do it yourselfer, you may decide to install the floor yourself. Consult a buyer’s guide, such as Consumer Reports, to find the top rated brands in each category. Wood floors are now popular in every room of the house – even the kitchen. Adding warmth, beauty, and value, you should get dozens of years of service from your new wood floor.